OCMC Missionaries Dn. Stephanos and Dk. Alexandria Ritsi with Tefta who is recovering from a stroke that she suffered after Christmas last year. Tefta has been an integral part of the Church’s Resurrection in Albania since the fall of communism in the 1990s. It was the day after Christmas when the stroke hit. For hours she laid there, no one knows how long, paralyzed by the assault to her nervous system. It wasn’t until a neighbor, unable to reach her by phone, went to check on her that she was found alone, collapsed in the winter’s cold. We often think of angels coming to our rescue in times of need, but on this day after the Feast of the Nativity, the angel was the one in need of rescue - and this angel’s name was Tefta. She had lived through the Communist oppression in Albania steadfastly clinging to her Faith even though it was dangerous to do so. When Communism fell, she was among the first to help resurrect the Church. She welcomed His Beatitude Archbishop Anastasios when he arrived to replant the seeds of Orthodox Christianity in a country that had survived brutal attempts to purge all religious expression. In the years that followed, she dedicated her life to serving the Church and sharing the Gospel. She participated in outreach, sang in the choir, and was a founding member of the women’s ministry. She worked alongside Fr. Martin and Pres. Renee Ritsi and Fr. Luke and Pres. Faith Veronis when they served as missionaries to Albania. Following her stroke, Tefta was admitted to the Mother Teresa Hospital in the heart of Tirana. She was not receiving adequate treatment, so former OCMC missionaries Dr. Charles and Maria Linderman made sure that she was transferred to a hospital better equipped to provide the needed care. After she was released from the hospital, she was placed in a home for the elderly. 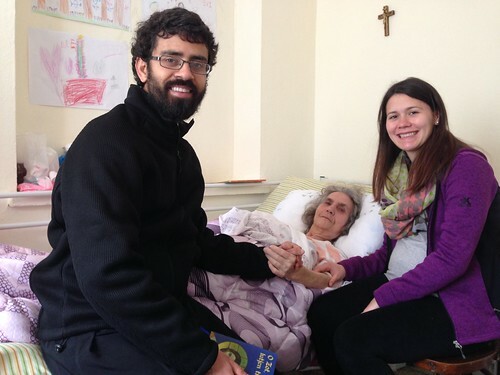 People from church would visit and see that she needed to be in a different environment if she were to continue her recovery, so His Beatitude arranged for her to stay at an apartment owned by the Church where she would be more comfortable. Now, a team of volunteers, overseen by OCMC missionary Pamela Barksdale, stays with and cares for Tefta. She is visited by an Orthodox Christian man trained in physical therapy and the doctors from the Church’s clinic, which houses state-of-the-art diagnostic equipment, look after her care. She is still unable to move the right side of her body, and she struggles to speak, but hopefully with time, care, and a great deal of prayer, Tefta’s condition will improve. The Orthodox Autocephalous Church of Albania has done amazing things since the 1990's. It has built and restored more than 400 churches and monasteries, and it has established a seminary that has trained hundreds of priests, catechists, and Church workers. But, most importantly, the Church has cared for people like Tefta. This profound expression of Christ’s love is at the heart of the Church’s mission in Albania and around the world.